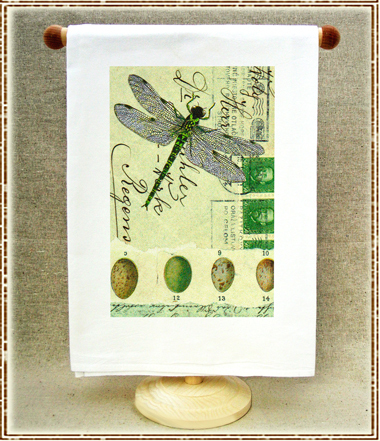 A great, fresh green on this dragonfly....over a beautiful old envelope with the perfect row of stamps...collaged with my signature eggs...things that make me smile. The towels measure 30" X 30" and are hemmed on all four sides. These extra large flour sack towels are an all cotton weave, resistant to unraveling and will wash with ease. We use a heat press transfer process so the colored inks are pressed right in to the fiber of the towel making them soft and absorbent all the way through. The image area may feel a little firm when your towels arrive, but will soften up after the first wash in warm water...no bleach please! LIfe is short, use the good stuff!